Now this is really a smart phone. 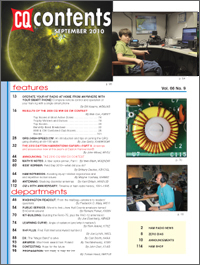 CQ's September issue kicks off with an article by Bill Kearns, WB6JAR, on using your "smart phone" to remotely operate your HF station at home from anyplace you have cellphone coverage. 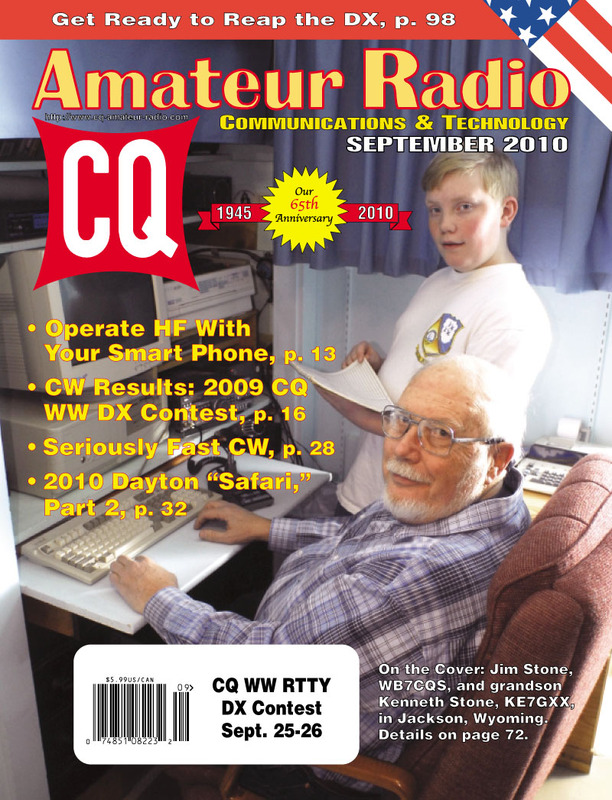 Next, we've got the CW results of the 2009 CQ World Wide DX Contest, with yet another record number of entries (5,966; over 12000 for both SSB and CW) and 16 new individual records, despite ongoing low sunspot numbers. Here are the very top scorers - interestingly, there were no repeats from last year: High Power - EF8M (RD3AF, op); Low Power - V26K (AA3B); QRP - FY5KE (FY5FY, op); Assisted - 4O3A (UT5UDX, op); Multi-Single -P33W; Multi-Two - CR3L; Multi-Multi - HC8GR. The first-ever winners in the Xtreme category were OL5Q (OK1HRA) / Single Op and B1Z / Multi-Op. Congratulations to all! Expanded results are posted here on the web. We've also got the rules for the 2010 CQ WW DX Contest (available here on our website as well). Serious competitors in the CQ WW CW contest tend to send Morse code pretty fast...but nowhere near the speed of the "QRQ" guys (and gals), who chat at 60-100 words per minute, all copied by ear (but generally sent by keyboard). Joe Gerry, KH6/W3GW, introduces us to the world of QRQ CW. We've also got Part 2 of our annual guide to new products introduced at Dayton, presented by New Products Editor John Wood, WV5J. This installment covers antennas and accessories. Our columns for September start out with "Washington Readout" editor Fred Maia, W5YI, digging into his mailbag to answer readers' questions; followed by Part 1 of "A Fiber Optics Primer" in "Math's Notes," by Irwin Math, WA2NDM. Public Service Editor Richard Fisher, KI6SN, reports on the steps taken by a committed group of ham in Texas to turn around a failing ARES® (Amateur Radio Emergency Service) organization; "Kids' Korner" editor Brittany Decker, KB1OGL, profiles the Field Day activities of several young hams who have appeared in her column before, plus we introduce you to the 2010 Newsline Young Ham of the Year, Cody Anderson, KI4FUV. 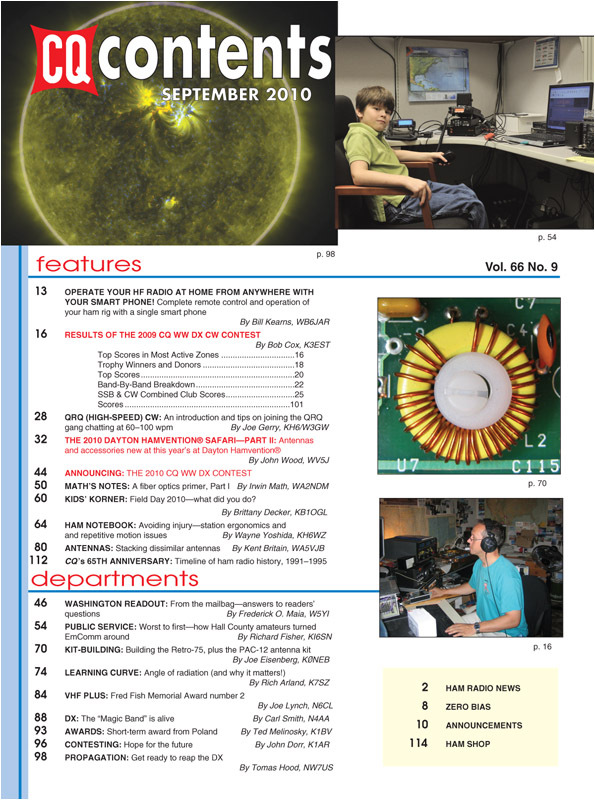 "Ham Notebook" editor Wayne Yoshida, KH6WZ, discusses how to set up your station to avoid repetitive motion injuries, such as carpal tunnel syndrome (for which he underwent surgery earlier this summer); and Kit-building Editor Joe Eisenberg, K0NEB, looks at building the "Retro 75" from Small Wonder Labs and the PAC-12 Antenna kit. Speaking of antennas, "Learning Curve" editor Rich Arland, K7SZ, explains angle of radiation (and why it matters), and Antennas Editor Kent Britain, WA5VJB, dispels some myths about close stacking of antennas for different bands. VHF Editor Joe Lynch, N6CL, reports on W5OZI's amazing achievement of working all U.S. grid squares, making Pat just the second person to win the Fred Fish Memorial Award for reaching that lofty goal. And on the topic of VHF, DX Editor Carl Smith, N4AA, focuses this month on DXing on "the Magic Band" - 6 meters - which featured some of the best DX of any ham band this past June. Awards Editor Ted Melinosky, K1BV, highlights a short-term award from Poland in honor of the 200th anniversary of the birth of composer Frederick Chopin; Contesting Editor John Dorr, K1AR, gazes into his crystal ball for a look at the future of contesting; and Propagation Editor Tomas Hood, NW7US, predicts the HF bands will be hopping this September and tells us to "Get Ready to Reap the DX"! That's a brief look at what's coming up in the September issue of CQ magazine, which should be on newsstands and in subscribers' mailboxes by late August. For information on becoming a CQ subscriber, click the "Click Here to Subscribe" button at the top of this page.